Le Corbusier Chaise Lounge in Brown and White Pony. 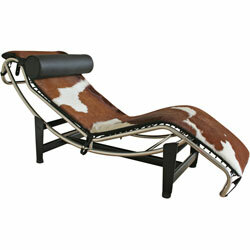 Le Corbusier Chaise Longue has been dubbed the ultimate relaxing machine by Le Corbusier himself. This Pony version brings class and elegance to your modern or eclectic home. It is the perfect way to relax at your home or office! It can be a great addition to your living room furniture or a great accent seating by the bay window or a stylish lounge chair for your master bedroom. Our solid steel frame will not chip nor rust unlike chrome plated versions. All joints are fully welded, sealed and sanded for a smooth finish. Original design lines by Le Corbusier.